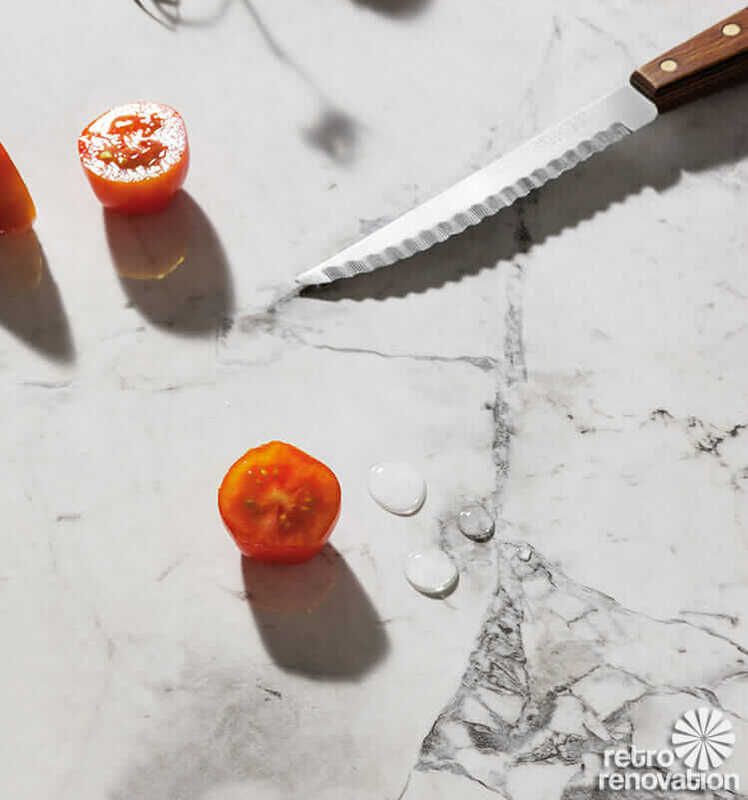 Wilsonart — Don’t forget to also check out their Virtual Design Library for a growing number of custom, digital-printed options — including several recent revivals from Wilsonart’s 1960s and 1970s archive, cracked ice patterns, and a large variety of boomerang laminate designs. Where to buy the Wilsonart digital designs: I suggest starting with A Moment in Time — Specialist provider of retro-vintage styles. 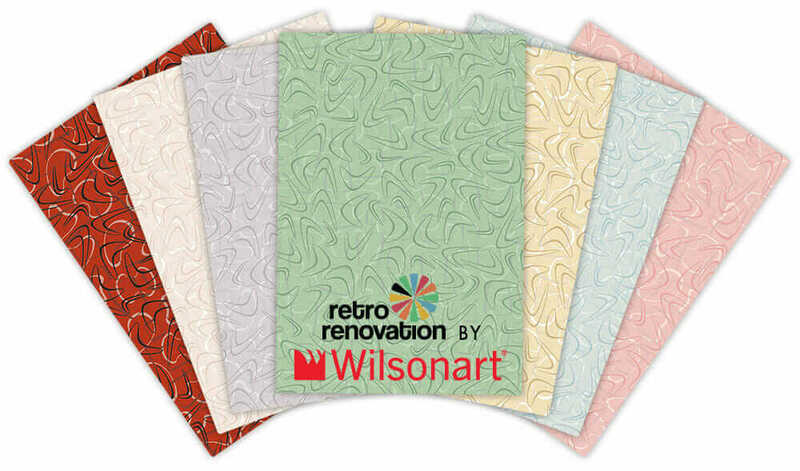 UPDATE 2016: You can also buy the Retro Renovation® by Wilsonart® laminate collection and some of the other designs from the Wilsonart Virtual Design Library affordably (I think) with shipping included via Home Depot! 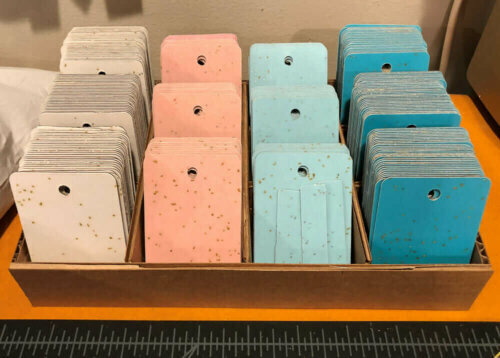 Boomerang laminate — See my story 29 designs and colors of boomerang laminate and where to find them. 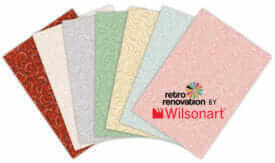 Most of the designs are made by Wilsonart, one is made by Formica. Make It Midcentury is the only place in the nation where you can get glitter laminate. It’s now available in a variety of colors, seen in the photo on the right. Formica — Boomerang in charcoal (the only color still available from Formica) is in Homeowners. But, Dogbones, Wefts and Warps are in To The Trade. 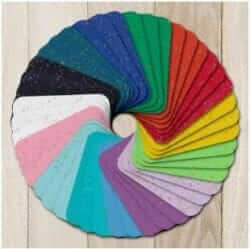 Abet Laminati — 195 solid colors… 136 woodgrains… 149 patterns… 33 metals… Easy-to-use website. If you need a solid color and can’t find it here — or at Arpa, below — it probably doesn’t exist. Arpa — Eye-boggling to search, but their colors look good, so may well be worth the trouble to pursue this brand for that reason. Pionite — Check out their linen-look laminates in Abstracts; colors are greyed out – more suitable for 60s and 70s than 50s, but overall, I quite like them. Arborite — They have some patterns I like, including a blueberry that looks like linoleum and some almost-linens. Easy-to-use website. Nevamar — Check out their abstracts. Decotone — Added to our list in 2015. Laminart — Added to our list in 2015. Lab Designs — Added to our list in 2013, they have some retro-modern styles worth considering. No substitute for seeing an actual sample — Of course, there is no substitute for seeing actual samples in the flesh. If you can order the samples in an 8″x10″ size, all the better. Smack it down in your kitchen or bathroom — and look at it in all lights during different times of the day. This is a prime opportunity to torture your spouse in the decision-making process. Do not become enraged by prices for the specialty laminates — Laminate must be stored flat, in a climate- and humidity-controlled environment. Specialty providers often also must invest more to hold inventory, and they do not benefit from the economies of scale possible in mass market production. Searching is going to take time and will blind you — Some of these websites are better organized than others. Be patient and be sure that, once you find a product page, you look at all the links to ensure you have not missed any sections. Good-Better-Best — Manufacturers may have good-better-best grades for a variety of requirements. Check out the options, and make your decision accordingly. On stuff that requires professional installation, all the more so, because that means replacing the product has two costs. Consider the practicality of the finish you select — Keep in mind that shiny finishes are more likely to show scratches. I have glossy in the two bathrooms, and they are doing just fine. But I don’t think I’d choose glossy for a kitchen. Watch the specifications — if it says “for vertical surfaces only” it means not for countertops, duh. Share your experiences — Readers, do you have any more tips of your own, or questions? We have been looking for original laminate for or 1963 trailer restoration project. We found it at Wilsonart page. Thank you very much for your links. Great!!!! Which one are you getting? 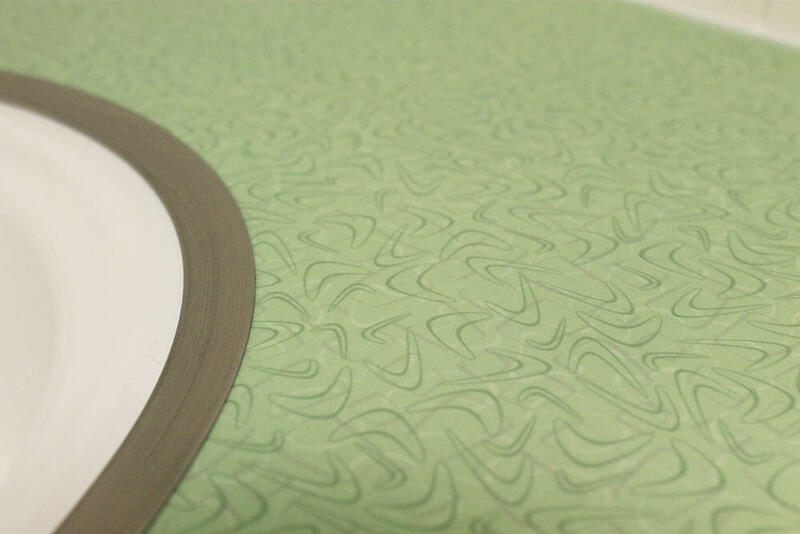 Formica now has the Envision where you design your own artwork. I have not seen it in person. 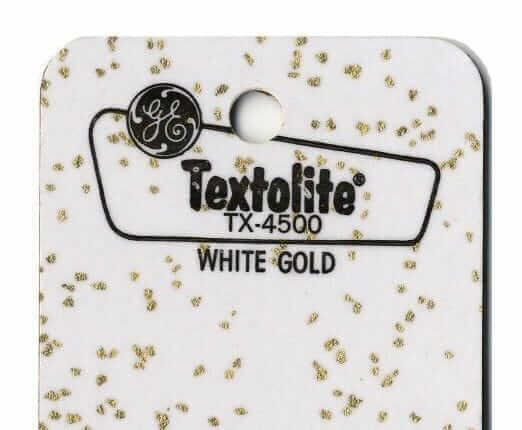 I am guessing they can’t do something shiny like the glitter look we all seem to be searching for. I am considering an atomic star pattern to go with my Kohler Triton faucets as an alternative to the glitter laminate. Having tried very hard, I will ask…can anyone find “almond” that was so ubiquitous in the late 1960-1970s? As a laminate? Did you look through all these sources? I was there, but that selection was not the green color in my kitchen. I’ve got the classic almond green appliances and counter top and the green vinyl mosaic floor. (It was a time capsule and so far I’ve been able to keep it in good repair.) If I could find a piece about 2ft x 3ft it would be enough to repair an area that was patched with white when a hole was made during a repair. Almond is not green. Almond is a beige. I think you mean: Avocado! Hi Mary, best place to sell stuff like this is likely craigslist. I am in cincinnati and am working with Formica Corp directly and they are supplying us material. the problem is we need a small piece of turquoise anything for an important part of our design. They haven’t made turquoise since 2012. Does anyone have a square foot of any vintage turquoise?